A solid away win at Wycombe Wanderers makes it three in a row for the Sky Blues. Despite now sitting 8th in the table, the prospect of mounting a bid for the play-offs still seems a distant one. While there have been small changes and improvements, it hasn’t really been enough to expect a sustained upturn in results over final months of the campaign. It would take a lot more than winning a fourth game in a row in this upcoming trip to Scunthorpe to change that feeling. With Luke Thomas having had his loan deal extended to the end of the season, it takes one thing off Mark Robins to do list in the January transfer window. Ideally, the addition of another wide player to the squad would give us a better balance – whether in the starting line-up or from the bench – but sorting out Thomas’ loan extension so early means there should be relatively little disruption to the XI for the immediate future. The big concern heading into this game surrounds the injury sustained by Liam Kelly against Wycombe. The midfielder has quietly been a key element of these past three wins in both the way he breaks up the play and his progressive use of the ball. Having to deploy either Michael Doyle or Abu Ogogo in his stead appears an uncomfortable drop-off, although Mark Robins has suggested that he’s considering playing the much lighter-weight Zain Westbrooke in Kelly’s place. The form at the minute should keep any other changes, if any, to an absolute minimum. In particular, the balance in attack of Jordy Hiwula starting games to press opponents high up the pitch and then Jonson Clarke-Harris coming off the bench to bully tired defenders is working quite nicely. The back four is settling into a useful and dynamic unit, while Lee Burge was playing with such confidence in goal that he could successfully pull off a Cruyff turn in our last game. Long may it last. We really should have capped a decent opening day performance against Scunthorpe United with victory. Decent first-half opportunities for Jordy Hiwula and Maxime Biamou were spurned before Tony Andreu scored an excellent free-kick early in the second-half to hint at the importance he was seemingly to have for the team this season. However, the late introductions of key players for Scunthorpe in playmaker Duane Holmes, subsequently sold to Derby County, and the ball-player Funso Ojo quickly turned the game on its head, leading to two late goals. Having arrived in August with the team just outside the relegation zone – of albeit a very nascent league table – to be in January inside the bottom four doesn’t speak well for a manager of McCall’s experience. There are mitigating circumstances, mainly the combination of losing the vast majority of the key performers in a play-off quality squad over the summer and almost all of the best players remaining picking up serious injuries. There have been signs of a revival over the past week, with back-to-back wins – and, importantly, clean sheets – as well as a proactive start to the January transfer window that has seen proven League One performers picked up in the form of Kevin van Veen in attack, winger Adam Hammill and set-piece expert Tony McMahon at full-back. 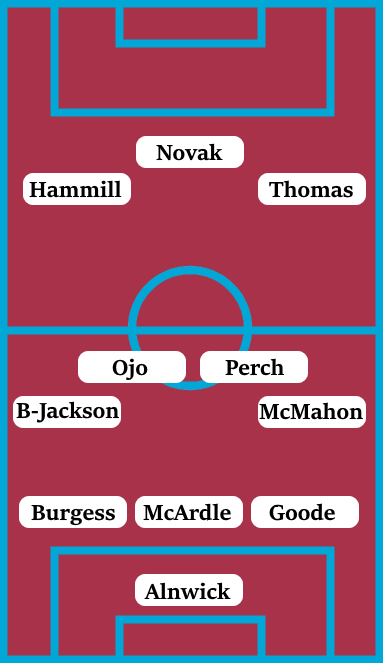 With less of a skeleton squad to work with, the next month or so will probably be a better indication of what McCall can achieve at Glanford Park. Aside from their three new signings, the player Scunthorpe will be looking to in this game is likely to be Lee Novak in attack. The experienced centre-forward provides a significant physical presence but has led the way for the Iron with 10 goals across all competitions this season. McCall may look to introduce the more maverick qualities of the big Dutch striker Kevin Van Veen at some point in this game, but Novak is likely to start ahead of him for now. Former Sky Blues hero George Thomas has endured an inconsistent season at Glanford Park, struggling to nail down a starting place but occassionally demonstrating the kind of quality that saw him score that goal at Wembley. Thomas seems to have settled into more of a creative than goalscoring role at Scunthorpe, and is impressed in their most recent win over Peterborough United. With more competition for his place due to the January signing of Adam Hammill, Thomas will surely be under pressure to perform in this game. As we saw at the Ricoh Arena, Scunthorpe have a central midfielder in Funso Ojo who can really pull the strings from the centre of the park. The Dutchman is not only an excellent passer of the ball but has the composure and balance to evade opposing pressure and give himself time in possession. It may not be so much about stopping him playing, but making sure the players he picks out have little chance of doing anything with the ball. Despite the back-to-back clean sheets, Scunthorpe’s defence still is the area to target. There are some really proven names at this level in goalkeeper Jak Alnwick and centre-back Rory McArdle, but they have massively underperformed this season with the latter looking to have lost a considerable amount of pace and is being punished for it. Stuart McCall has switched consistently between a back three and back four which probably hasn’t aided attempts to build confidence at the back, although this has often been enforced by injuries. Given the league position Scunthorpe are in, along with the recent upturn in form and new signings, they are likely to approach this game in a positive, attacking manner. It’s our job to resist the pressure they’re going to want to put us under and attempt to pick them off on the counter-attack.